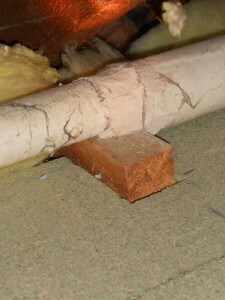 Many properties still have the older style cotton cased / covered glass fibre pipe insulation. We have noted on a number of occasions that when the pipework was originally installed, plumbers in the 1950’s and 60’s and up to the early 70’s sometimes used asbestos to conceal insulation ends and provide a joint where the cotton cased insulation meets. 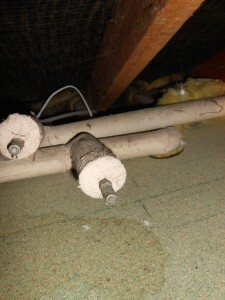 When carrying out a Full Building Survey on a property in Chilham near Canterbury, Kent noted asbestos to the pipe casings within the roof void. This asbestos based product is a severe health hazard and in order to rectify the problem a specialist asbestos removal company will need to strip out all pipework from the roof void before any other work can be carried out to the property.